Elaine Schmitz, author of Recipes & Recollections of My Greek-American Family, organizes a reading group that I joined this month. The six people in the group take turns recommending a book for everyone to read and then they meet once a month to discuss the chosen book. 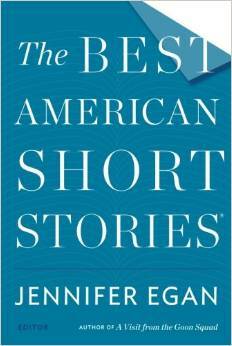 Elaine’s choice for January was The Best American Short Stories 2014. She has read each year’s version of this book for ten years. It was interesting to hear her compare the story trends over the years. Four readers attended today. Two of us loved the stories and the other two thought they were too depressing. As we talked about the protagonists and their situations and environments, we all agreed that as writers, we learned about the way the authors drew us into the plot, how the characters changed or didn’t change, and why the editor picked those particular stories. We reviewed which stories took risks formally, structurally, and in terms of subject matter. Although we didn’t give the same examples, we could understand why our members shared their view with differing stories. Jennifer Egan, the editor explained that the series editor, Heidi Pitlor, winnowed 208 publications to 120 individual stories and then Egan had to choose the final 20. Pitlor stated in the Foreword that Egan looked for stories that went somewhere new and strange. “She wanted to surprise and confound.” These stories certainly fulfilled her criteria. For me the anthology is a page turner. I wanted to read the next story because I enjoyed the last one. I disliked only 3 out of the 20. The other 17 were mind expanding and influenced my writing. They modeled unusual approaches to deepening a story. I highly recommend the book. So glad you joined and enjoyed the meeting. The book was challenging and your comments were informed and informative. You are a delightful and helpful addition to the group. I look forward to your future contributions to our discussions. Thanks, Elaine. This first meeting was even better than I imagined it would be. You are a good moderator. You and Linda will bring new perspective to the group. I didn’t get a chance to read this month’s book, but it is on my list. Thanks, Julie. I had to laugh because Linda and I agree on editing work, but we had opposite perspectives about this book.